Think about that feeling when you wake up the day after an intense workout and as soon as you move to get out of bed you can’t help but groan because you’re so sore. Now think about how having someone else massage an especially sore muscle or doing it yourself can hurt but feel good at the same time. Lifting weights, general strenuous exercise and even stressful daily activities can cause our muscles to feel tight and sore. We can even get “muscle knots,” as people like to call them, where a particular area of muscle feels uncomfortably tight and stretching just doesn’t release the tension enough to feel completely normal. Firmly massaging these “muscle knots” with a thumb can even cause pain to radiate out to the surrounding muscle, even though that’s not where you’re touching. For quite some time, athletes and personal trainers have been using a simple secret to release this muscle tension and discomfort: the foam roll. A foam roll is exactly what it sounds like, a cylindrical piece of hard foam, and it is designed especially for use in self-massaging sore and tight muscles! The official name of what most people casually refer to as “foam rolling,” is self-myofascial release, which means to massage your own muscles to release tightness and soreness. I prefer the fun verbified form of the noun, so I’ll call it foam rolling. The first time I learned to use a foam roll, I actually wasn’t feeling very sore at all, nor could I identify any especially tight muscles; I was just doing it because I was learning how to do so in a fitness class. However, we started by rolling the quads and hamstrings and I quickly realized that whether you think you do or not, you probably have a lot of muscle tension that could benefit from some foam rolling! I usually have fairly tight hamstrings, so as soon and I put the pressure of my body weight down onto the roll and started moving it down the back of my thigh, there was definitely some major discomfort involved! Now, why would I do something painful, you might ask? 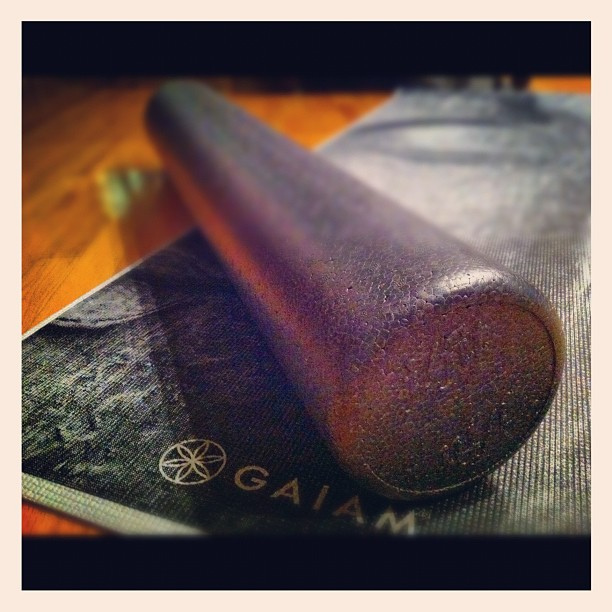 Foam rolling muscle pain is one of those “it hurts, but in a good way” kind of muscle feelings. Stretching, or a deep tissue massage, can also be painful, yet people still do it voluntarily and claim to feel better afterward. This is a similar situation and you’re just going to have to trust me until you try it when I say that you’ll feel so much better afterward. 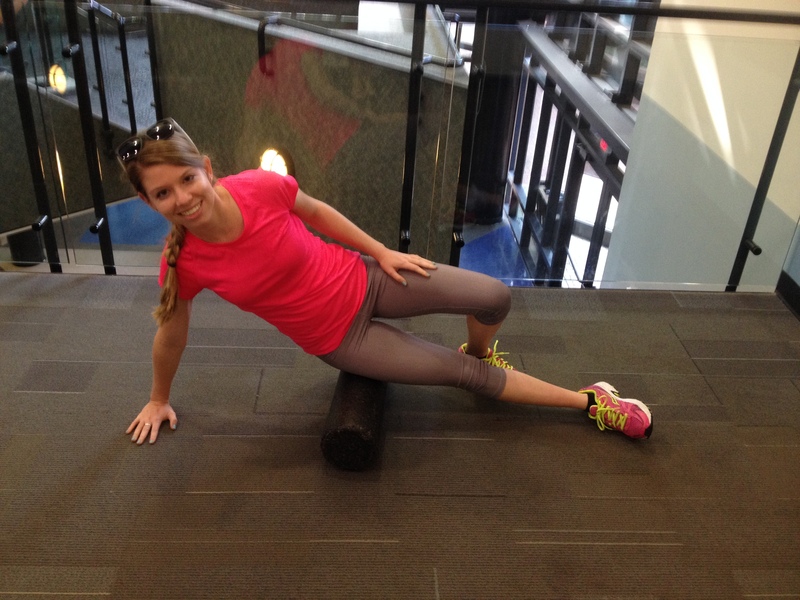 Here are the basics of how foam rolling works. First, start with your foam roll, comfortable clothing, and some space to lay on the floor. You’ll pick a muscle that you want to target, and we’ll just stick with the hamstring example for now. Your hamstring muscle runs down the back of your leg from the bottom of your gluts down to the back of your knee. Start by placing the foam roller under your leg at the top of one of your hamstrings, stretching out that leg and leaning back so that your hands are on the floor behind you and are holding you up slightly. Then, slowly release your arms so that your hands are still on the floor behind you but the majority of your body weight is resting on the foam roller. Then start to move yourself backward over the roller slowly, so that it rolls down toward the back of your knee. This is where you might start to feel some discomfort, so listen to your own body to tell you whether you’re feeling pain (bad) or discomfort (good), and use your arms to lift some of your body weight off of the roller if it becomes painful. Here I am, foam rolling my hammies for you guys. Never roll over a joint or directly on a bone. Doing so can cause more harm than good. An example of rolling over a joint would be rolling down your hamstring all the way down to your calf, because you’ve rolled over your knee joint. 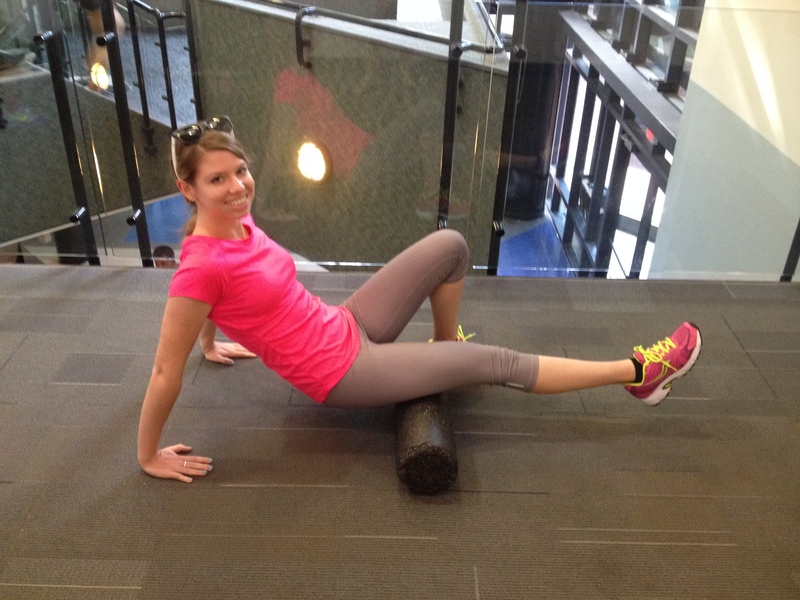 Instead, roll down to just above the knee, move the roll beneath the knee, and then continue to roll over the calf. An example of rolling over a bone would be laying on your stomach and rolling up your quad over your hipbone. Any bones that you can clearly feel are not protected by muscle and you shouldn’t be rolling over them. Do not roll your lower back or neck muscles. These are more sensitive to damage, and your pain in these areas might be coming from a problem that needs to addressed by a professional, such as a chiropractor. Do not roll the same areas over and over in a short period of time. If you concentrate on a certain muscle group, wait at least 24 hours to roll that muscle group again to give it time to relax and heal. Always roll with the grain of the muscle. Your hamstring runs vertically down your leg, so you should never roll horizontally across your hamstring muscle. It’s best to actually keep your rolling in a single direction, so after your roll down your hamstring, remove the roll and start back up at the top if you’re going to do it again instead of rolling back up the hamstring. Here is an awesome article called “How to Foam Roll Like a Pro!” It includes cartoon graphics to help you know how to target certain muscles! I have to say that I think that place that is consistently most uncomfortable yet most beneficial to me is rolling my IT band, which is the muscle that runs down the outer side of your leg above the knee. Try rolling yours and tell me if that doesn’t make you make some crazy faces because you had no idea how much tension you had to release there. Rolling the IT band; I’m still smiling because I wasn’t actually putting my full body weight on that thing at this point. The simultaneous laughing and cringing comes later. Shortly after you foam roll, and especially the next day, you should start to feel your soreness fade, your muscles become more relaxed, and your range of motion increase compared to before you foam rolled! You can purchase your own foam roller at any major sporting goods store for anywhere from $10-$40 depending on how intense you want to get, but you can also check out foam rollers from the front desk of the Student Recreation Center on campus for convenient and free use! P.S. Side comment– I have no idea why a hunk of foam can cost $40. Try it out the next time you come to work out and make it a regular part of your routine! I can’t lie, I almost kind of like the sore feeling in my muscles after a good workout because it makes me feel like I’ve done something worthwhile when I can actually feel the change, but what I don’t like is constant or long-lingering soreness and foam rolling definitely helps me prevent that from happening! Ironically enough, it can also help you wake up and start your day in the morning if you have time, but can still help you relax and feel ready to sleep if you choose to do it at the end of the day. It might feel silly at first, but give it a try and you’ll see why it’s worth it! I’m pretty sure I’ll be doing some foam rolling this week after I attend the “muscle-cut barbells” and “upper body conditioning” group fitness classes; be sure to check back in at the end of the week to read my reviews on what I thought about both classes! Previous Article “Eyes on the Street”: Why Be Active In Your Community?